On Jan. 18, 2018, the Royal Thai Army paraded in Bangkok as part of the annual Royal Army Day. The event featured many examples of Thailand’s military hardware including tanks, artillery, anti-aircraft missile launchers and armored fighting vehicles. Riding along in the parade were odd-looking, low-profile jeeps transporting senior officers. A closer eye might notice a resemblance to the Kübelwagen, or “tub car,” a goofy-looking light utility vehicle produced by Volkswagen, driven by the German military in World War II, and which remains a collector’s item and movie prop today. Close, but not quite. The Thai officers are riding in Volkswagen Type 181s — a post-war successor to the Kübelwagen used in both military and civilian worlds. In the United States, Volkswagen marketed the bizarre-looking machine as “The Thing.” But the Thing has an interesting history in its own right which owes much to the Cold War as it does World War II. As the Third Reich re-armed in the 1930s, German soldiers needed motorized wheels, so Adolf Hitler approached the famed engineer Ferdinand Porsche to supply a design. From that came the two-wheel-drive Kübelwagen, of which Volkswagen would manufacture more than 50,000. 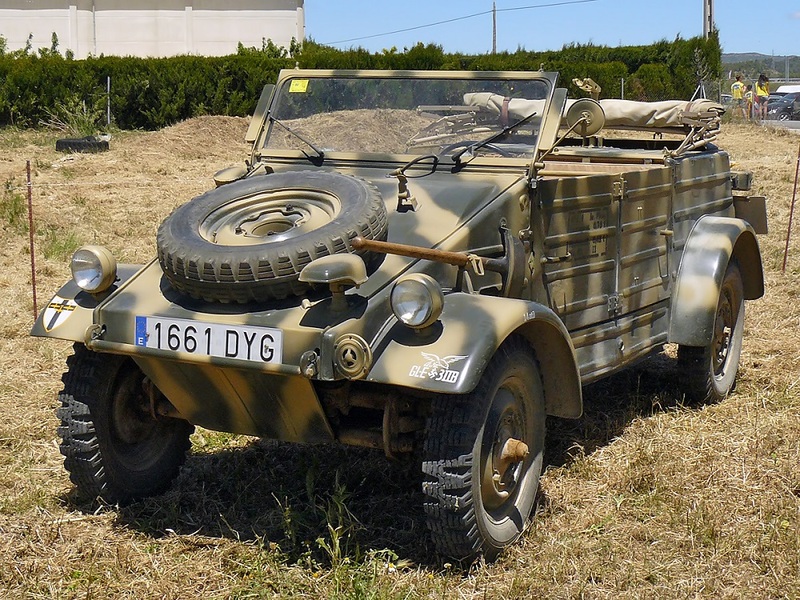 To put this number in perspective, the United States went on to churn out more than 600,000 four-wheel-drive Willys Jeeps — one indication of the German military’s relatively low level of mechanization during the war. Even late in the conflict, far more German soldiers moved by literal horsepower than mechanical. Nevertheless, the Kübelwagen was a unique and capable vehicle, and its flat bottom — like a sled — helped keep it moving if the tires sank in muddy conditions. The Third Reich also developed the Schwimmwagen, or “swimming car,” a four-wheel-drive modification of the Kübelwagen capable of floating. The swimming car contained an adjustable propeller for forward movement when on the water. Then came the Type 181, a.k.a. “The Thing,” known in Mexico as the Safari and in Britain as the Trekker. This vehicle emerged as a result of a separate project called the Europa Jeep, a failed NATO project to develop an amphibious transport vehicle. The Europa Jeep was never put into production, and as delays mounted in the 1960s, the West German government approached Volkswagen to produce a temporary vehicle until the Europa Jeep was ready. Volkswagen went back to the Kübelwagen design, modified it and developed the Type 181, which the automaker also marketed as a novelty car aimed at American surfers and off-roaders — albeit an expensive one. The Type 181 came with several important differences from the Kübelwagen — the new, wider floorpans came from the Karmann Ghia, instead of the Beetle like the original Kübelwagen. The Cold War vehicle had a new suspension and a bigger engine, although it was underpowered. They were roughly the same size, although the Type 181 weighed 500 more pounds. Tim Brooks, writing in The National, noted that stricter safety standards — led by consumer advocate Ralph Nader in 1975 — removed the car from the American market given its almost total lack of safety features, “which is a little ironic given it was designed to protect troops in war.” The Thing sold for only two years in the United States in 1973 and 1974. Another good resource for all things The Thing is this video below from auto historian Doug DeMuro. Pay close attention to the spartan interior and detachable rooftop and windows. The war which the Type 181 was designed for never came, although NATO armies would go on to put 50,000 Type 181s into military service. There may even be a future for the model beyond a collector’s oddity, as Volkswagen brand manager Herbert Diess in 2017 floated the idea of bringing back the design as an electric car, while using the terms “Type 181” and “Kübelwagen” interchangeably. 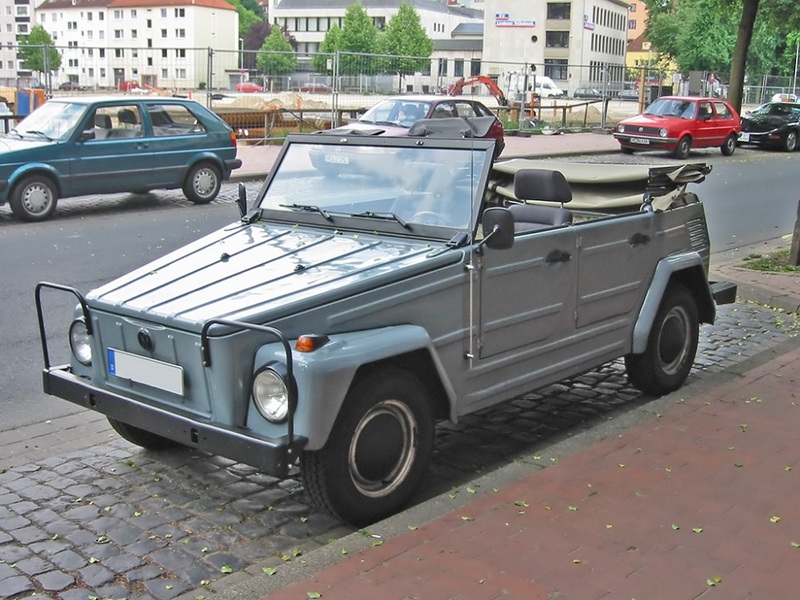 However, there are no plans to bring back the Schwimmwagen, as an all-electric version of that particular amphibious vehicle would perhaps be unwise. But futuristic, redesigned but-still-boxy Kübelwagens with pop-off windows and rooftops rolling around in the near future would be an interesting quirk of automotive history — like the fact that the Type 181 still has a honored place in Thailand.